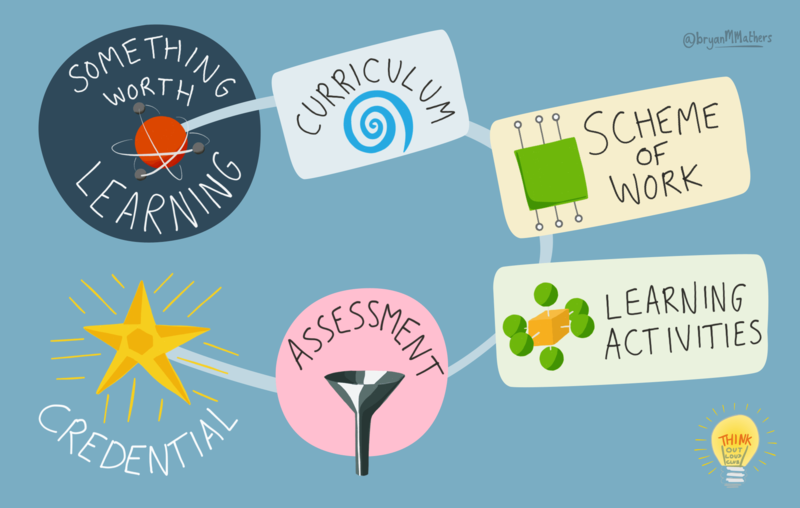 The image above was created by Bryan Mathers for our presentation at BETT last week. It shows the way that, in broad brushstrokes, learning design should happen. Before microcredentials such as Open Badges this was a difficult thing to do as both the credential and the assessment are usually given to educators. The flow tends to go backwards from credentials instead of forwards from what we want people to learn. But what if you really were starting from scratch? How could you design a digital skills framework that contains knowledge, skills, and behaviours worth learning? Having written my thesis on digital literacies and led Mozilla’s Web Literacy Map for a couple of years, I’ve got some suggestions. One of the most important things to define is who your audience is for your digital skills framework. Is it for learners to read? Who are they? How old are they? Are you excluding anyone on purpose? Why / why not? You might want to do some research and work around user personas as part of a user-centred design approach. This ensures you’re designing for real people instead of figments of your imagination (or, worse still, in line with your prejudices). It’s also good practice to make the language used in the skills framework as precise as possible. Jargon is technical language used for the sake of it. There may be times when it’s impossible not to use a word (e.g. ‘meme’). If you do this then link to a definition or include a glossary. It’s also useful to check the ‘reading level’ of your framework and, if you really want a challenge, try using Up-Goer Five language. It’s extremely easy, when creating a framework for learning, to fall into the ‘knowledge trap’. Our aim when creating the raw materials from which someone can build a curriculum is to focus on action. Knowledge should make a difference in practice. One straightforward way to ensure that you’re focusing on action rather than head knowledge is to use verbs when constructing your digital skills framework. If you’re familiar with Bloom’s Taxonomy, then you may find The Differentiator useful. This pairs verbs with the various levels of Bloom’s. A framework needs to be a living, breathing thing. It should be subject to revision and updated often. For this reason, you should add version numbers to your documentation. Ideally, the latest version should be at a canonical URL and you should archive previous versions to static URLs. I would also advise releasing the first version of your framework not as ‘version 1.0’ but as ‘v0.1’. This shows that you’re willing for others to provide input, that there will be further versions, and that you know you haven’t got it right first time (and forevermore).